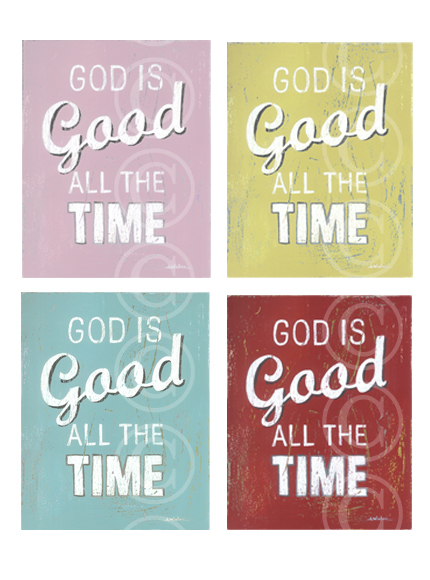 Inspiring Ideas with artist Jeanne Winters: Art Print Giveaway - God is Good! 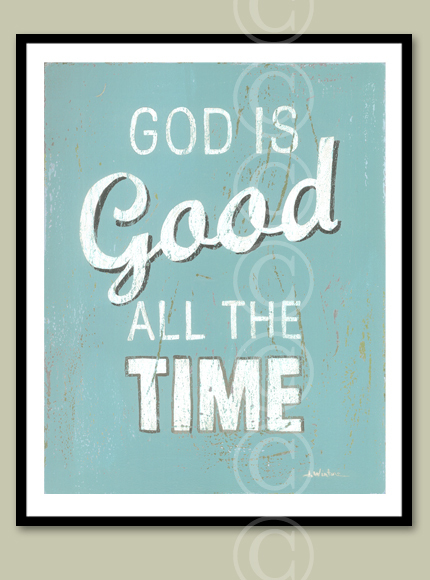 Art Print Giveaway - God is Good! ... in addition to the original red version. So, what color would you choose??? Enter to win a free God is Good art print, or another 8x10 of your choice from my art collection, by leaving a comment on this post. Don't forget to become a "fan" on the "Jeanne Winters" facebook page I'll be doing giveaway posts over there, too! I am so glad you've added more colors! I love the aqua! Thank you for the chance to win! ☺ Blessings to you! I would love to win! I have recently been peeking at your stuff on Dayspring I believe!! Just haven't had the extra funds yet! I would have a hard time choosing a color or a print for that matter. 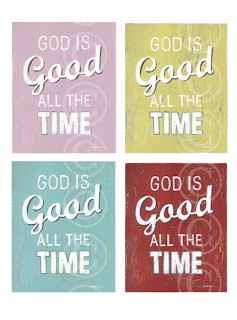 :) but the yellow and aqua are probably my favorites on the God is Good print. First of all, thank you so much for giving one of your special prints away. As for the color...I love the red and vintage yellow...oh, and the aqua!!! ;-) HOPE your day is blessed! I think I like the vintage yellow best of the new colors. You are so generous to give away one of your prints. I am already a facebook fan and have used some of your ideas in a different way. Your prints are lovely. I especially like the bloom where you're planted series. I just love the original red one, though the blue is, surprisingly enough, taking a close second today. : ) Thank you for this giveaway! Oh Jeanne ... a great giveaway and a wonderful reminder as well. Thanks for the opportunity to being the winner. Love these! The aqua is great! Love the original red too! LOVE, LOVE, LOVE YOUR PRINTS! THE NEW AQUA WOULD BE MY FAVORITE FOR THE GOD IS GOOD PRINT. WE ARE EXPECTING A NEW GREAT-NIECE IN JULY AND I'D LOVE TO BUY ONE OF THE DESIGNS FOR A NEW BABY!! THANK YOU FOR THE OPPORTUNITY TO WIN ONE OF THESE BEAUTIFUL PRINTS! Oooh I love the aqua and the red one! I would love to have another one of your prints! I think the yellow is such a sweet, cheery color. What a great reminder of the Truth despite our circumstances. Oooooh!!! I just love. your. stuff. I love it all. There's no way I can choose just one...unless I were forced to by winning! Beautiful. If I facebooked I would definitely like you. All the colors are pretty. But I think I would pick red. I got teary-eyed reading this. Something so simple as these few words, just stop me in my tracks. And make me take a moment to remember when everything else in my life seems yucky..God IS good! Oh, I love this print! So true! I love the aqua but the classic red would go with my house too. oops...didn't realize I'd be anonymous...hi, I'm Christal (christalh@msn.com) and I'm not technologically savvy at all! Love your inspiring ideas! Would love one of your prints for my (hopefully soon) remodeled kitchen. Have a great day! i love the purple one! great prints! I love your work and would be so excited to win. Thank you for the opportunity. What a wonderful giveaway! Thank you for the chance to enter. Jeanne, I love your work. My favorite is "May Your Cup Overflow" - but I love everything I've seen! ooooh, yellow or maybe aqua...can I choose if I win? 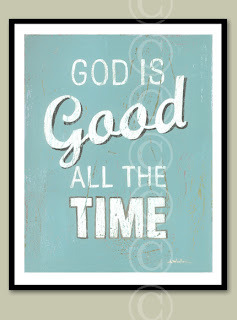 I love the "bless our nest" print that I bought, and would put the God is good print in my foyer!! oh i would love the yellow one. i have 2 of your prints already & i love them. one is in my daughters room & the other is a christmas one. i love your stuff. The colors are amazing! You have such a gift.